I hope you all had a great week, it's gone pretty quick which I am very happy about. 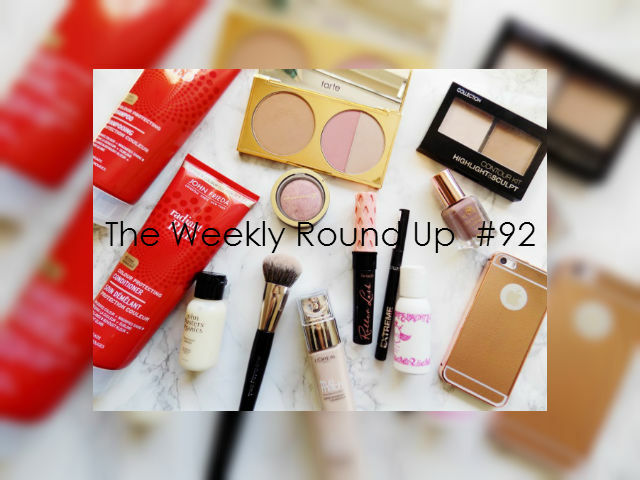 So it's weekly round up time, and I hope you like the new look of my posts recently. I have been much happier with how my blog looks since the re-vamp so I hope you like it too. Enough jabbering let's get into my faves from the week. Is that a new foundation I hear you ask? No, it's just L'Oreal True Match's Foundation but in new packaging and with a new and improved formula. 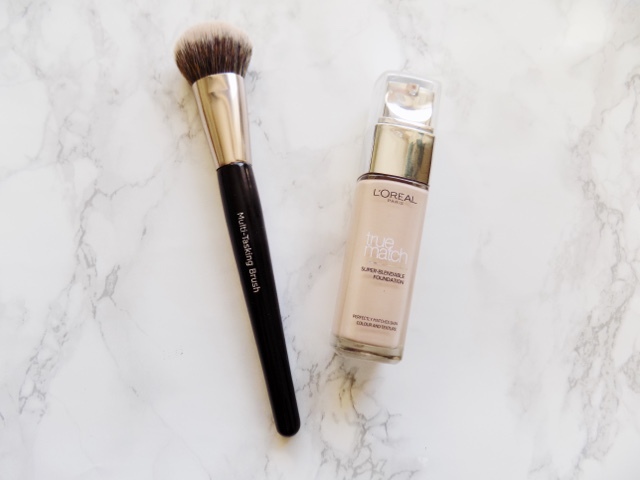 Yes, they re-formulated it, which I will be doing a post on, but I have been loving this foundation with the Look Good Feel Better Multi-Tasking Brush as it applies a really great medium flawless coverage so I just love how it looks. 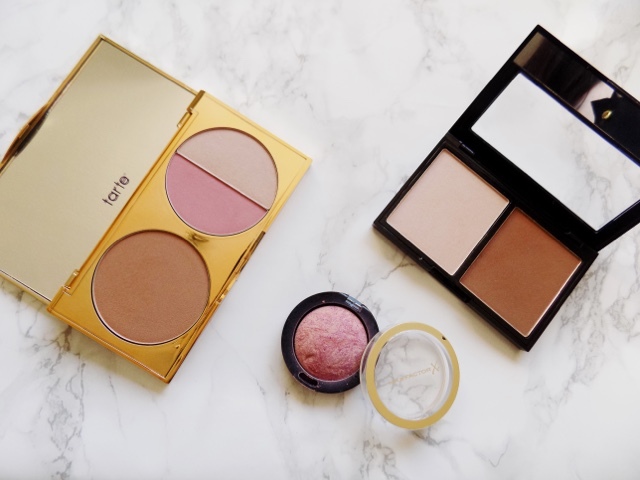 I've been pretty obsessed with these two contouring/highlighting products this week, first is the Tarte Park Avenue Princess Palette which has the Amazonian Clay Waterproof Matte Bronzer in the shade Park Ave Princess, an Amazonian Clay 12-Hour Blush in the shade Posh and the Amazonian Clay Highlighter in Champagne Gold, which I didn't even know existed until I got this palette, but it's so stunning on the cheeks and it's a great everyday highlight. It's a beautiful palette, all the shades are right up my alley and I have been loving it. 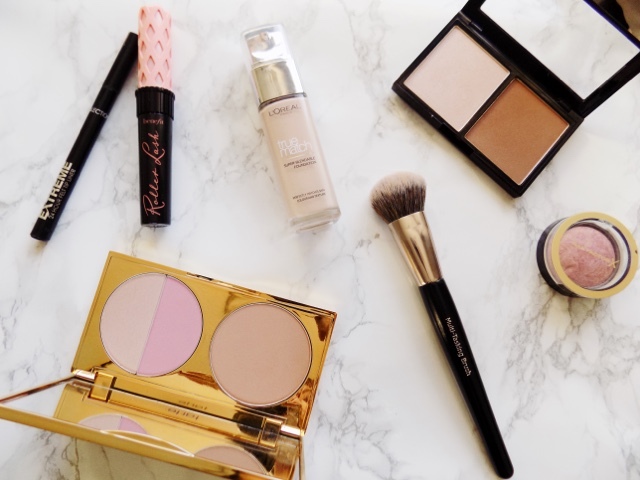 For a more drugstore version and a brand new product from Collection is their Contour Kit Highlight & Sculpt, this is pigmented as heck and such a beautiful shade highlight and a great bronzer and contour powder. This really surprised me actually as I thought it would be really orange and glittery but the bronzer is matte and the highlight is a neutral, pretty champagne shade and although it has pretty large chunks of glitter in it it still looks pretty and great on the cheeks. 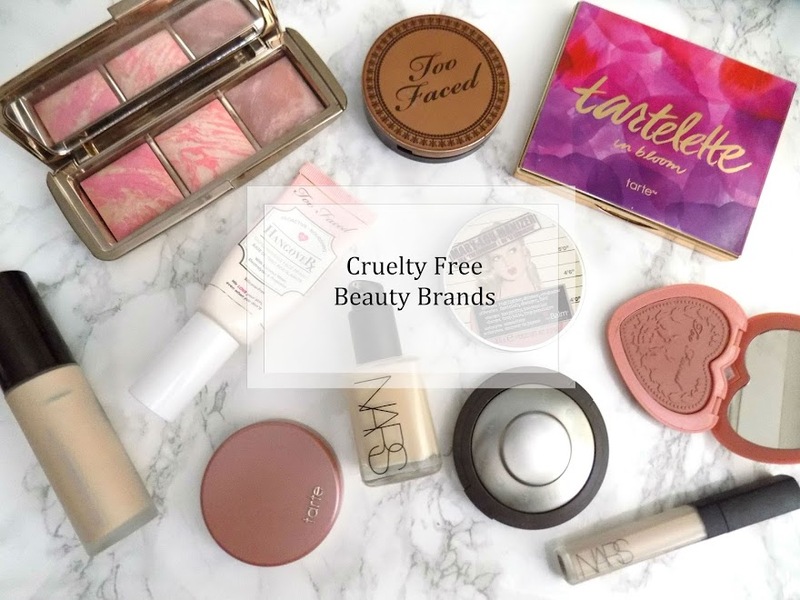 I have been loving the Maxfactor Creme Puff Blush in Seductive Pink as it's just the perfect pink shade for my skin and these are super long lasting and are drugstore dupes for the Hourglass Ambient Lighting Blushes which are just stunning but way too expensive compared to the price of these. 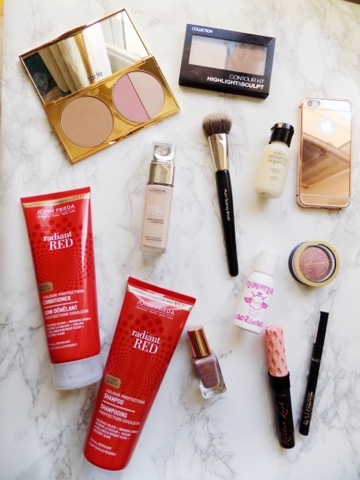 But I have been obsessing over all of these products this week. 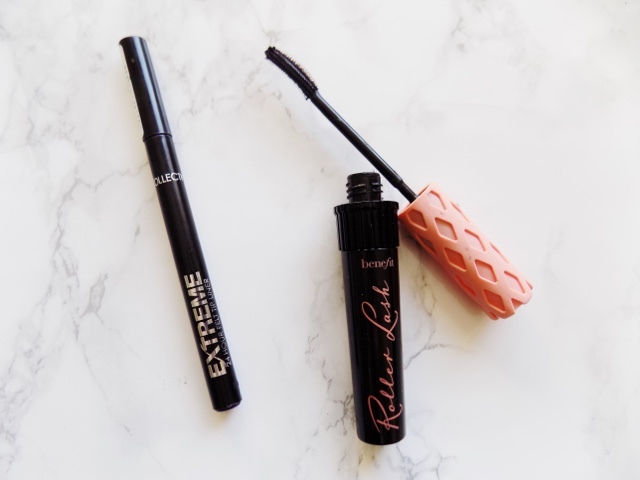 For the eyes I purchased the full size Benefit Roller Lash Mascara so I have been using this every day. I love it just as much as when I first tried it and think it's a great everyday mascara. I've never purchased a high end mascara but this is definitely worth it, especially when you get it with Birchbox points. I have been trying something different with my makes this week and I've been reaching for the Collection Eyeliner in Purple. It's a subtle change from black and I just love how it looks. There will be a look coming up with how I wear this so keep your eyes peeled for that. 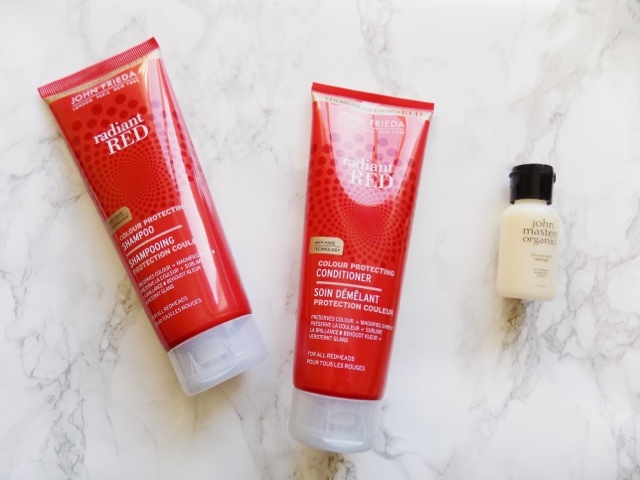 I have recently dyed my hair red and so I am doing everything I can to maintain the colour as I know just how fast red hair can fade, So I picked up the John Freida Radiant Red Shampoo & Conditioner a few weeks ago and started using it this week and I have been loving it. The shampoo lathers up well but doesn't strip the hair or irritate my scalp, and then the conditioner is pretty thick so it does wonder to the ends of my hair. I don't have to go in with another more nourishing conditioner, this one does a decent job on it's own. I have also been trying out the John Masters Organics Detangler which was in this months Birchbox which you can see here, and it's basically a cream hair detangler so I apply this into my wet hair and then when I run a brush or comb through my hair the knots are so easy to comb out, no tugging and pulling on my hair which I just hate as it gives me headaches when my hair is knotty. So I am loving this and it also smells really nice and citrus-y which is always pleasant to have. I didn't know this product even existed but also in this months Birchbox is the Beauty Protector Body Wash, this smells just as amazing as their hair products and I am totally obsessed. What's even better is that it's not as pricey as the hair products (which are still only around £16) so I will definitely be picking this up when I make another order on the Birchbox site. You may have seen this weeks Monday Mani (if not then click here), but Barry M have launched some of their Autumn polishes and I showed you them on my nails and personally I love them, but the shade in particular that has really grabbed my attention is Dark Side of the Shroom which is from the Sunset Daylight Curing line which is 100% my favourite polishes ever. It's a beautiful mauve/taupe/purple kind of shade and I love it for the transition into the colder months. I purchased this case from eBay on Tuesday and by Thursday it had arrived which is pretty darn good service if you ask me. 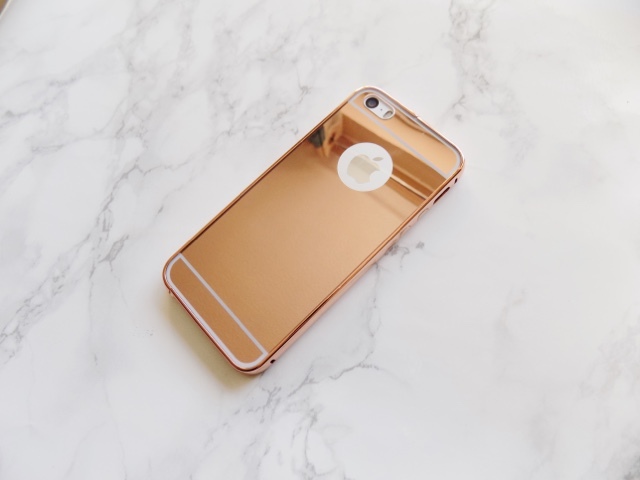 But its a rose gold case which I am completely in love with and I'm obsessed with it so it had to be in my weekly favourites. If you want to check it out here is the seller I purchased it from. That's it for this weeks round up. Tomorrow is all about my favourite pieces of jewellery which I wear more than anything else. Have a good Saturday. 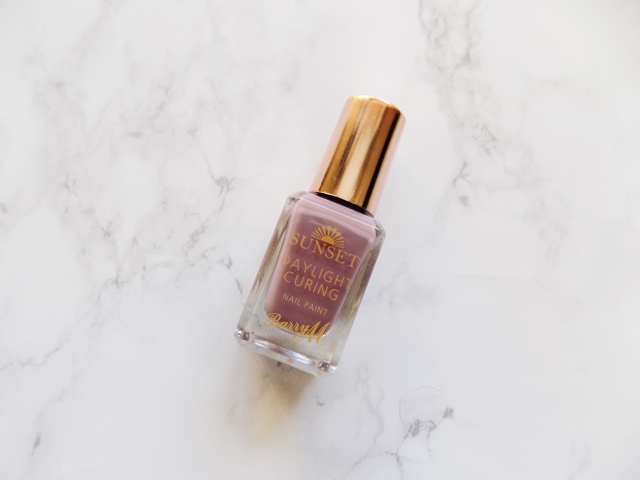 this nail polish is a gorgeous shade!